The Arbiter Systems®, Inc. Remote GPS Receiver provides GPS synchronization for the Doble Model F6150 at the standard GPS frequency (L1 band) of 1575.42 MHz. Thus providing the best timing accuracy for the Model 933A and the Doble Model F6150. Although the remote GPS receiver is sealed against the weather, it is designed for temporary outside operation. 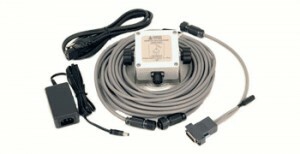 This part number includes the power supply, power cable (P01 – P10) and adapter for Doble GPS port, as shown. It is typically used as a cost-effective alternative to synchronize end-to-end testing applications with the Doble F6150. Inlet IEC-320 with fuse and mating P09 cordset.